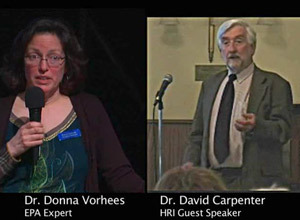 The Housatonic River Initiative hosted Dr. David Carpenter in April at an HRI forum where he shared his opinion regarding the impact of PCBs remaining in the Upper Housatonic. 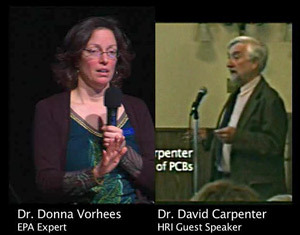 As you consider what you think should be done about the remaining PCBs, we’d like you to take a moment to compare what Dr. Carpenter said the last time HRI invited him to the Berkshires with what Dr. Donna Vorhees, EPA’s consultant, said at an EPA workshop last spring. Q: Should Berkshire County residents be concerned about PCBs in the air? A: Not according to EPA’s Dr. Donna Vorhees who disagrees with the Housatonic River Initiative’s Dr. David Carpenter. Q: Is any exposure to PCBs unsafe? A: Not according to EPA’s Dr. Donna Vorhees. The Housatonic River Initiative’s Dr. David Carpenter disagrees, saying we’re all at greater risk.